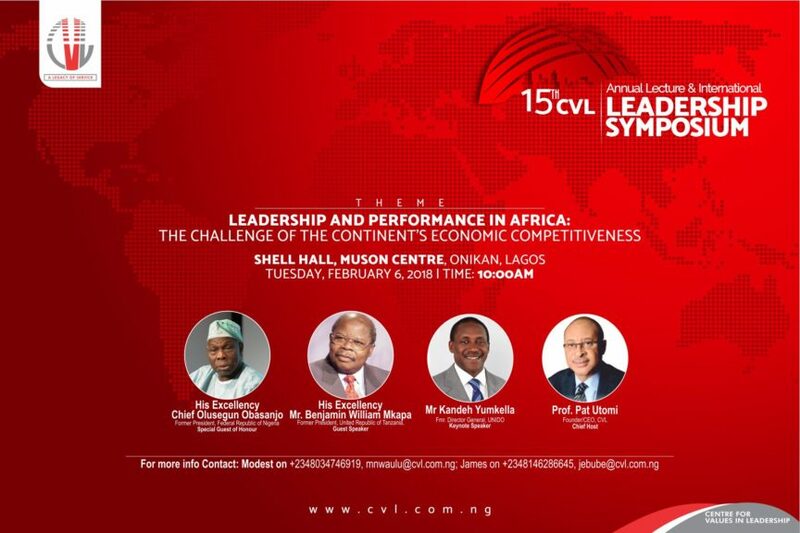 The quality of leadership in Africa and its implications for development and growth on the continent is the major focus of the 2018 edition of CVL Annual Lecture and International Symposium to which five former and current Presidents in Africa have been invited as Speakers at the annual event taking place in Lagos on February 6, 2018. The theme of the one-day event is Leadership and Performance in Africa: The Challenge of the Continent’s Economic Competitiveness. and Member of the European Parliament. Former President of Ghana, His Excellency, Flight Lt. Jerry Rawlings has been invited to Chair the symposium while the tone for conversation at the Lecture will be set by the Keynote Address to be delivered by His Excellency, Dr. Kandeh K. Yumkella, the former Director General of the United Nations Industrial Development Organization [UNIDO] and now Presidential aspirant in Sierra Leone. The Chief Host is Prof Pat Utomi, Founder/CEO, CVL. The 2017 edition of the lecture series took a critical look at the theme – Living Well Together, Tomorrow: The Challenge of Africa’s Future Cities with Prof. Paul Collier, Director, Centre for Study of African Economies, Oxford University, UK as the keynote Speaker. Prominent among past speakers at the annual lecture are: His Excellency, Prof Yemi Osinbajo, Vice President, Federal Republic of Nigeria; His Excellency, Mr Paul Kagame, President, Republic of Rwanda; Dr. Akinwumi Adesina, President, African Development Bank; Dr. Ekwow Spio-Garbrah, Former Minister of Communications, Ghana; Prof Ibrahim Gambari, Former Under-Secretary General and Special Adviser to UN Secretary General; Lady Olga Maitland, MP (Sutton & Cheam) UK; Mr. Babatunde Fashola, Former Governor of Lagos State; Mr Richard Dowden, Director, The Royal African Society and Former African Editor of the Economist; and Governor Akinwunmi Ambode, Governor of Lagos State. The annual lecture series is CVL’s commitment to engendering conversations that will aid initiation of policies that are business friendly and capable of lifting the continent, particularly Nigeria out of poverty as well as growing leadership that can make these happen. My name is Samuel Adamu Joshua i am interested in the Annual lectures that is coming on the 06 February 2018. My name is Babajide Olufemi Elemo a Professor of Biochenistry and the Director Centre for Environmental Studies and Sustainable Development at the Lagos State University, Ojo. I am intetested in attending the Annual Lecture coming up on the 6th of February, 2018. My name is Aderemi Olatunji Adebosin, a student of political science student of University of Lagos. I am interested in the upcoming annual leadership lectures for the year 2018 . Quite great!! Can’t wait to attend.